Lock in a great price for Priya Homestay Kandalama – rated 8.9 by recent guests! Best place for everyone. Calm place. Restaurant is naturally and it has sweet meals . Priyas Homestay is in a calm village next to busy Dambulla. The day I arrived he offered to take me on a bike ride to the lake and through the paddy fields. It was amazing. He also took me to Pidurangala rock to see the sunrise up there. As I didn’t know what to do or see he showed me a bit around on a little private tour on his motorbike. Priya always went the extra mile. I had the room with the en-suite bathroom. It was clean and comfy. Priya also runs a restaurant where I had the best rice & curry (cooked by his wife) and also the included breakfast was nice. Definitely recommend it. The garden, the restaurant, the terrace - everything was very beautiful! Dinner was amazing. The staff is very friendly and the owner is eager to take you on all kinds of tours. He offered me a free biking tour to the closeby lake and he also took me on a scooter around the lake. The Sri Lankan breakfast varies every day and is served in really big portions. Lunch and dinner can also be enjoyed in the restaurant for low prices. We really enjoyed our stay. The room was very nice and clean. The guesthouse has a nice terrace where to spend relaxed evening. Although the guesthouse is a bit far from the city, you can rent a scooter from the host and very easily reach all the most important sightseeing. We really enjoyed homemade breakfast and dinner. 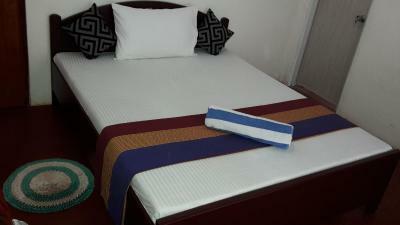 Located within 7 miles of Dambulla Cave Temple in Dambulla, Priya Homestay Kandalama has accommodations with free WiFi. A buffet or Asian breakfast is available each morning at the property. There's an on-site restaurant, which specializes in Asian cuisine. Rangiri Dambulla International Stadium is 8 miles from the family stay. When would you like to stay at Priya Homestay Kandalama? House Rules Priya Homestay Kandalama takes special requests – add in the next step! One child under 16 years is charged USD 5 per night when using existing beds. Additional services (bike rent, Tuk Tuk ride, ..) were a bit pricey! It would have been nice to have had a mosquito net, seen the insects in and around the hostel (which are of course due to the location out of town). It would also be good to close the small openings in the ceiling to keep insects out. Amazing place!!!! Best sunset in Sri Lanka next to the lake while Priya took us through the rice fields!! The owner and his family were very kind and helpful, we had really amazing time there. Room was good and clean, the best Sri Lankan food we have there. Owners made really nice romantic dinner for us last evening. We were wearing traditional Sri Lankan sari, live musician play only for us and the food very delicious! I think it was the best homestay for us in whole Sri Lanka! We absolutely recommend! We also were in elephant safari for a good price and that was absolutely awesome, because we have seen many elephants!